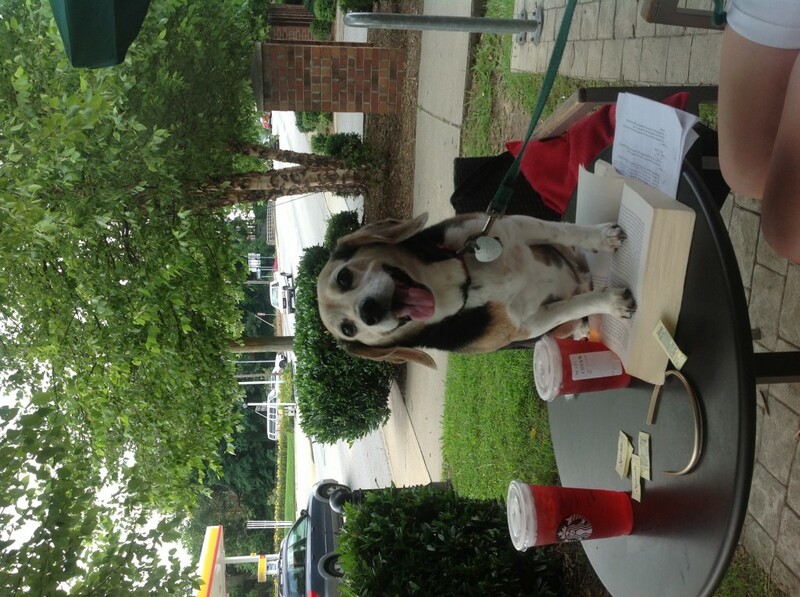 Tag Archives for " Beagle "
Sitting down to do a little summer homework at Starbucks. He was supposed to live forever. I felt sure he’d live to be 15 at least. That meant I’d have him another four years minimum. 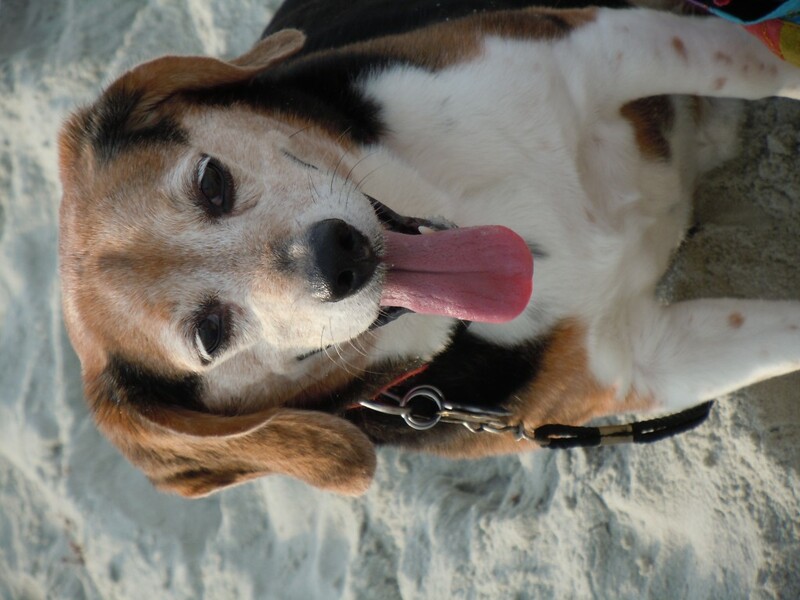 And heck, Butch—the oldest beagle on record—was 27 when he died, so I figured if Butch could do it, so could my Charlie. Charlie and I found each other one September afternoon in 2003. I’d been looking for a dog since my youngest child, Margaret, went to kindergarten a month earlier (the house had become way too still). I prayed about it all the time, asking God to guide me to the right dog for our family. I had in mind an adult female mixed-breed rescue; but despite visiting several shelters, I had not found one with whom I felt even a slight connection. It was my husband who suggested a beagle puppy. 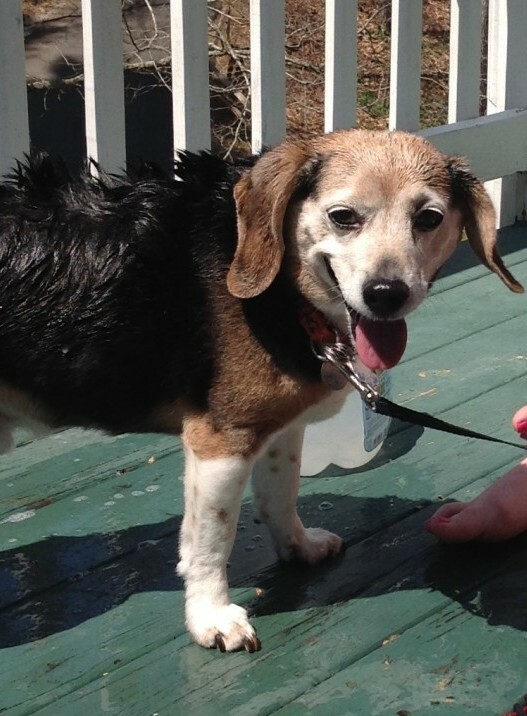 I checked the classifieds and of all the beagle listings, one ad stood out to me. “Three month old, tri-color beagle puppy. The children (5, 7, and 9 at the time) buckled up, and we followed the back road directions I received when I called the number listed. We rounded the last bend and the address came into view. As we drew closer, I saw a woman out in the yard with a blur of black and tan at her feet. I pulled up and shifted into park. 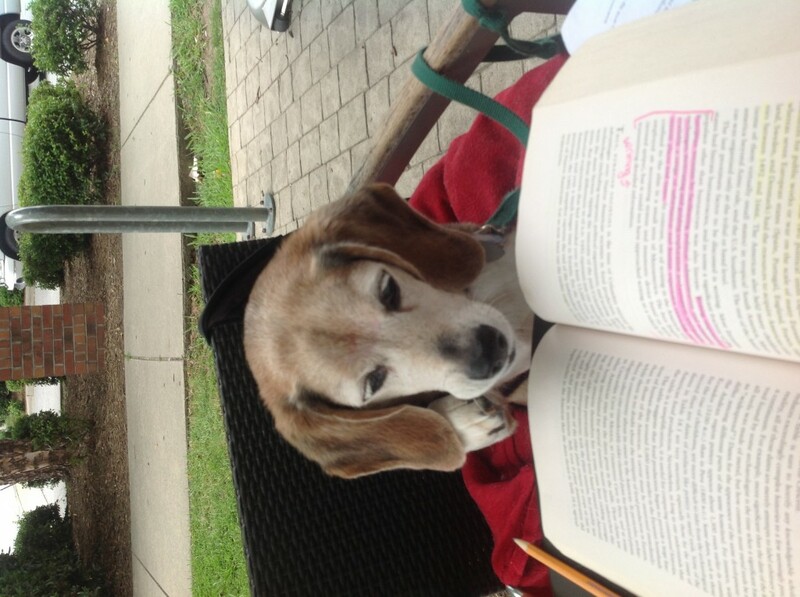 The blur settled into a brown-faced, floppy-eared, saddleback beagle, his white-tipped tail waving to me. Instantly, I knew. I knew because I felt deep in my spirit that all-to-rare feeling of being perfectly in sync with God’s will. I’m not exaggerating when I say it was truly one of the high holy moments of my life. I bent down and held out my arms. He came to me. 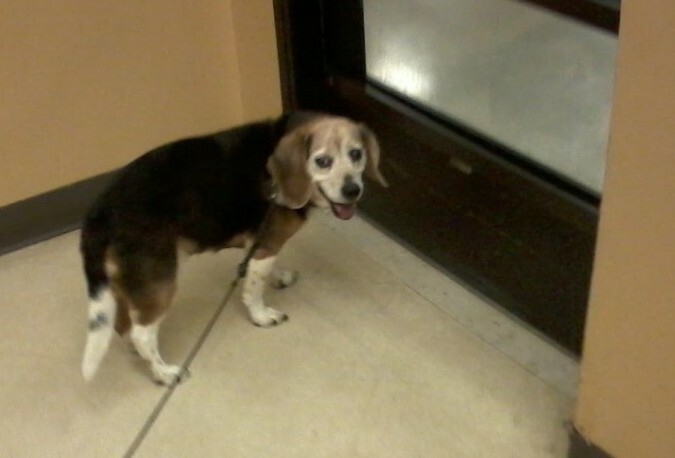 And in less than 20 minutes, we were on our way back home with the beagle I’d already named Charlie. At puppy school a week or so later, the trainer remarked, “Wow. Charlie is definitely bonded to you. It’s unusual for such a connection to exist so soon.” Unusual? Shoot; it was downright supernatural. Fast-forward 11 years to June 7, 2014. My oldest daughter would be 20 in a month; she was living and working in DC for the summer. My son was about to graduate high school and Margaret, 16, was finishing her sophomore year. She was the one who called to me, “Mom! You need to come here! Something’s wrong with Charlie!” I went upstairs immediately to the kitchen where I found Charlie standing, awkward and immobile. He seemed stunned, confused, afraid. I scooped him up and Margaret and I took him to the closest vet. Still, it absolutely did not occur to me that my sweet baby could be dying. That was unthinkable. By the time we got out of the car ten minutes later, Charlie had begun losing hair by the fistful. He could still walk, but he trembled all over, his tail sagging and his steps unsure. In the exam room, we held him close, telling him what a good boy he was, so handsome, so brave. When the vet came in, I lay Charlie on the table, continuing to stroke him while I told the doctor what had been happening. After the briefest of exams, the vet told me it didn’t look good. He could barely get a blood pressure and Charlie’s heartbeat was weak. Seconds later, his heart stopped beating and he was gone. It hadn’t been forever. Not even close. The day started with a bit of coffee at Creperie Cafe where Charlie rebuked a corgi mix and a jogging sinner or two. Once in the office, he modeled godly behaviors such as sitting and staying and began storing up treats in his tummy where neither moth nor rust can destroy and where thieves can not break in and steal. In time, a local parishioner, Cocker Spaniel Micaiah, stopped in for counseling. Naturally, Charlie consulted The Prophets. The session was so successful that it led to a spontaneous choral offering. When Michaiah went forth to prophesy, Charlie observed Sabbath. And it was good. There are few things I find as satisfying as sitting outside a coffee shop writing. The only thing that makes it better? Having company. 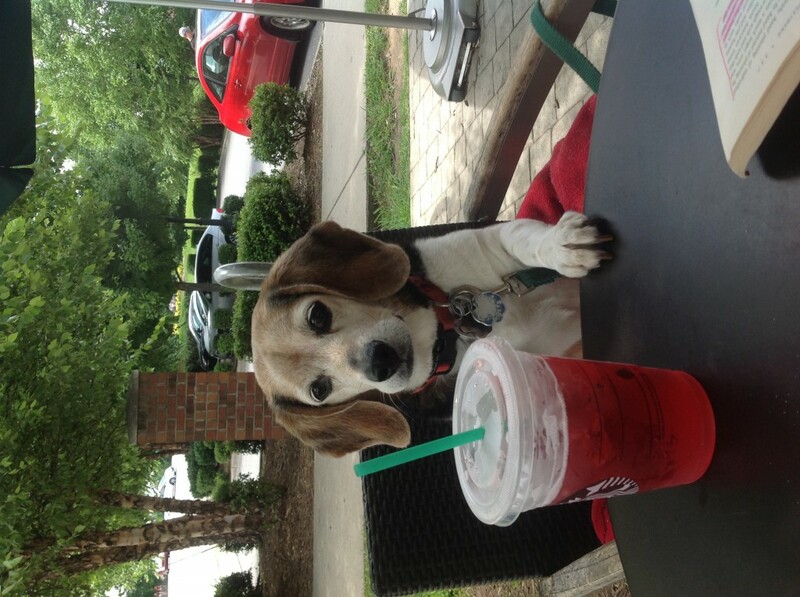 Today, my daughter Margaret and I are at Starbucks™ in Asheville. She is doing summer homework and I am doing a bit of writing. We have a lot to do. Luckily, we have some help. Sitting down to do a little summer homework at the coffee shop. "Come on Margaret! I'm not doing this by myself you know." "Summer homework is just delicious!" 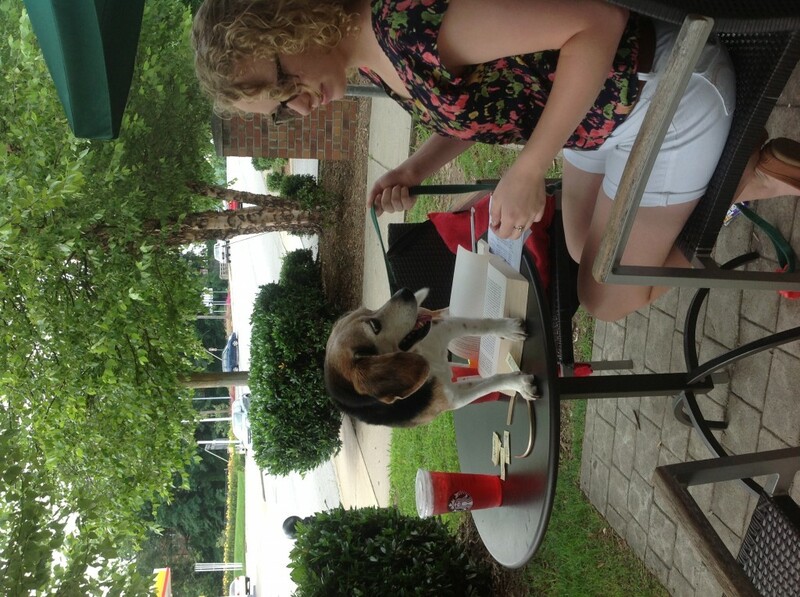 Our beagle, Charlie, absolutely loves to eat. We’ve often wondered, if he were left alone with a never-ending supply of kibble, would he just keep on eating and never stop? We had no evidence to the contrary; so it was anyone's guess and not something we were willing to test. We got our answer one Friday morning when my husband, Jay, went down to the garage before breakfast. We keep dog food in the garage in part because Charlie is rarely in there by himself. We leave the food in its original bag, rolling the top down tightly to keep out the critters. In Charlie’s 10 years, we’ve never had a problem. So, that morning in the garage, Jay noticed a nearly full bag of dog food—not the huge 20-pounder, but a travel bag of about five pounds—was open and more than half empty. Naturally, he went in search of the most likely culprit. Charlie blinked and looked away, breaking eye contact. Charlie tried again to stand. This second attempt got him out of the bed and mostly on his feet, his tummy hanging low: it was twice its normal size! He took a step, then sat down. He worked his way back up to a stand, only to be pulled back down by the weight of his girth. He looked up at us, bewildered. 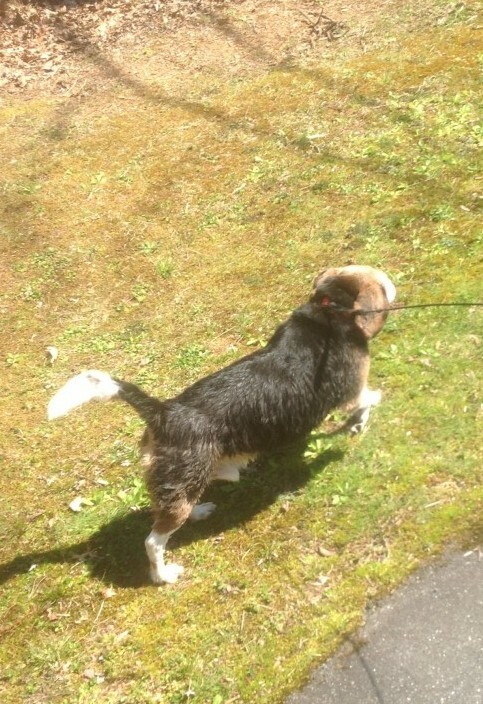 As best we could tell, in just 12 hours, our 22 pound beagle had increased his body weight by over 10 percent. It was no wonder he could barely walk. Charlie missed breakfast that morning, and dinner that evening and by the next day he was pretty much back to normal. But now we know. Charlie will indeed stop eating when food is still available, but not until he is completely miserable. 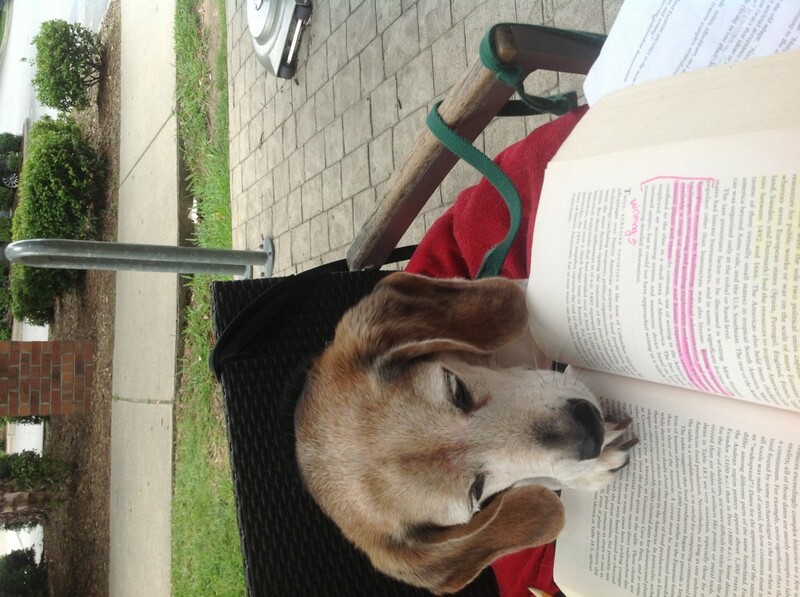 Just one more bit of evidence that Charlie is just about human. "How long do (fill in name of breed/species) live?" "How old is (fill in pet's name)?" People ask me these questions all the time. I'm pretty sure they do so to keep from saying, "Whoa. 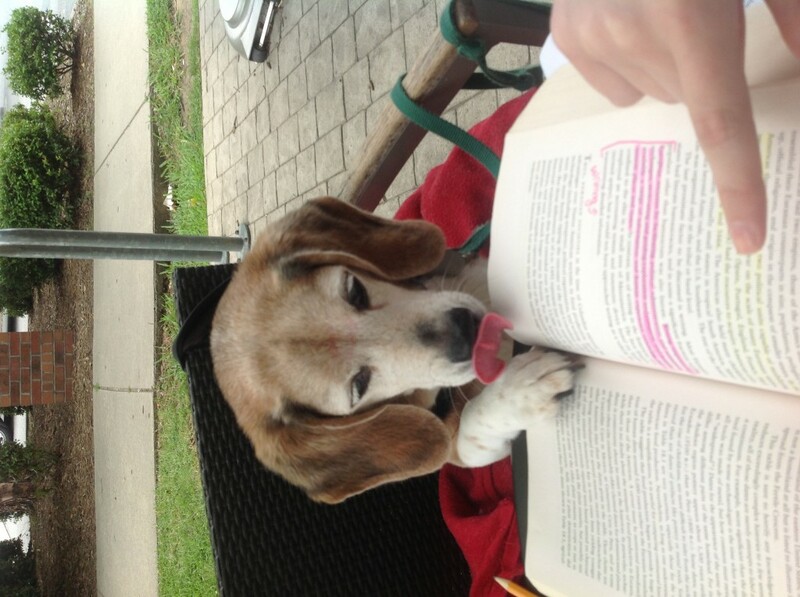 Your dog is seriously old. Isn't he about to kick it?" So, ya know, thanks. Credit given. But for everyone who might want to ask in the future, here are the answers. It really isn't amputation. First of all, amputation would take a lot longer. This is a five minute gig at worst. Seriously. By the time I get back from paying up front, Charlie's toenails are trimmed (ground, actually, but that sounds so much more brutal, don't you think?) and he's ready to go. I make a day of it--it's like a field trip really. We go for a nice walk outside around the pet store; Charlie sniffs up all the latest gossip. We go in where he visits the parakeets and the guinea pigs and checks out all the latest in pet apparel and doggy toys. And after the deed is done, he gets a treat and another walk. All he has to do is spend five minutes with a nice groomer and leave a small sample of his toenails. So why the face? Why the tail tuck? Why the earth shaking tremors? After I retrieve him, I apologize profusely to the poor groomers. "I'm so sorry!" I tell them. "I've worked with him on this since puppyhood. I've done everything the vet says to do, but still he behaves like this." "Like what?" They ask, cocking their little heads beagle style. "He's fine. Squirmy, but not nearly the worst we've had." They hand me back my little Shakespeare who is back to whimpering and quivering, looking as if he's just been told he'll never walk again. Little faker.I stare him down, unyielding. He blinks, working up a tear, and just like that I'm a goner. "You want a treat buddy? Here's a treat! What a good, brave boy you are!" He takes his treat, nods to the audience, and prances away without so much as an acceptance speech. Ingrate. "Charlie and The Wicked Toenail Grinder." Charlie knows better. We know he knows better because he doesn't jump on the couch upstairs when we're home and especially not when Alpha Dog (AKA Daddy) is around. 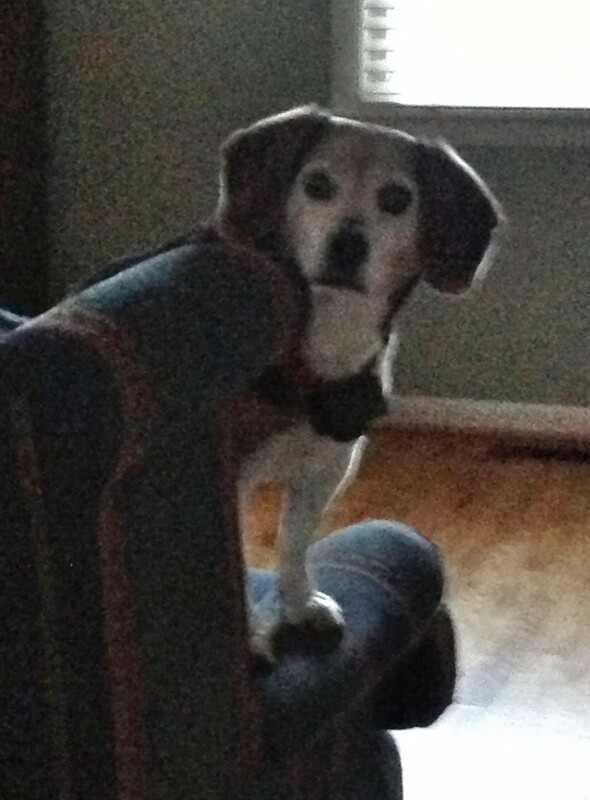 But occasionally when we come in the front door, we're met by a not-too-guilty-looking beagle peeking over the back of the couch. It's as if he's saying, "So that whole 'stay-off-the-couch thing?' You didn't mean that did you?" 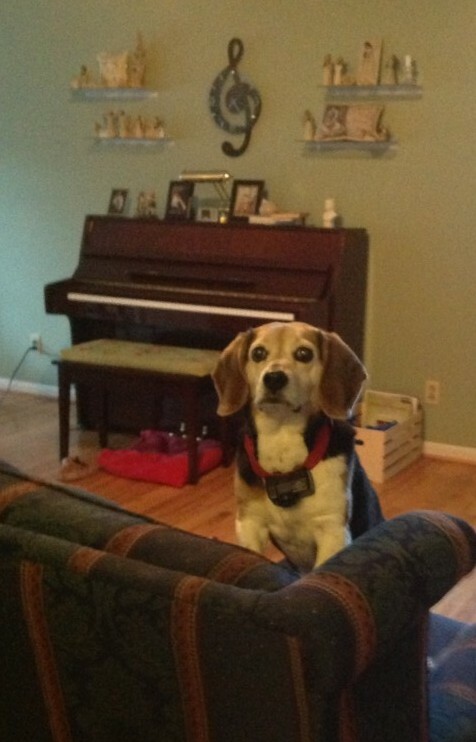 Because I am not fluent in Beagle-speak, I understand how some things I say get misconstrued. A few examples to illustrate my point. One of our favorite amusements is watching Charlie get settled. He has plenty of legitimate beds, but naturally he prefers the human spaces. Today, like many days, being on the couch wasn't enough. 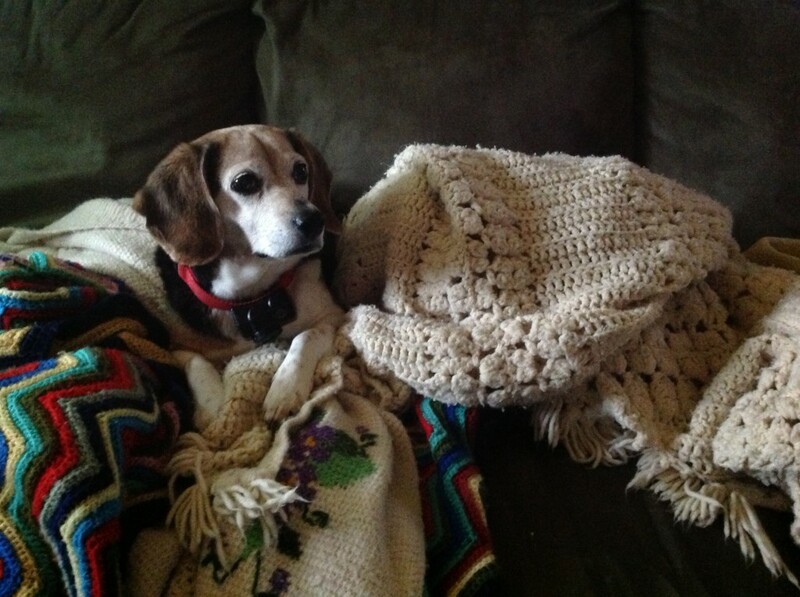 He nudged throw pillows and pulled blankets until he had the perfect little puppy bed. And doesn't he look like the innocent one!